My team and I welcome you to the Mercure Poitiers Site du Futuroscope hotel. Whether you're here on business or for pleasure, our main aim is to ensure that you enjoy your stay. 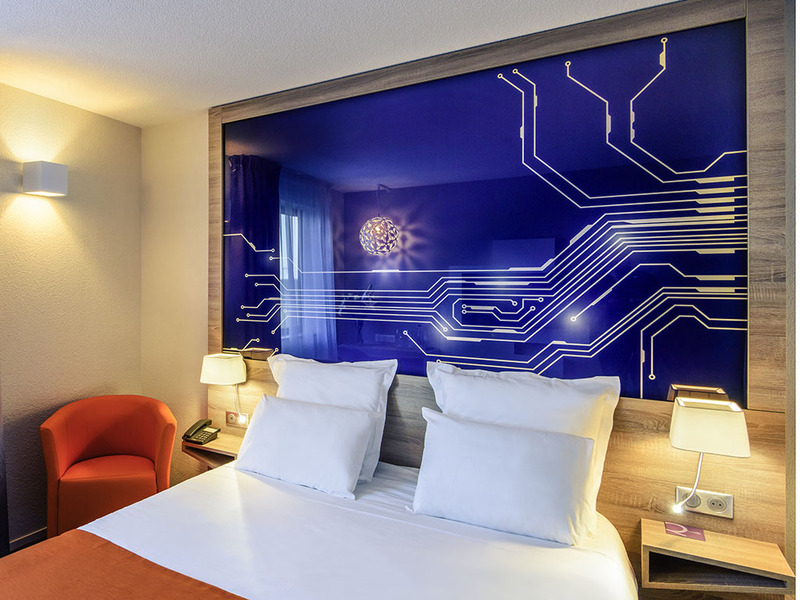 Fully renovated in 2016, the 4-star Mercure Poitiers Site du Futuroscope hotel offers Comfort, Privilege and Family rooms with contemporary décor. The buffet breakfast is served in a dedicated space with a bright and relaxing ambience. Our restaurant "La Cuisine de Marie" prepares home-made dishes using fresh, local produce. We have over 8073 sq. ft. (750 m²) of fully equipped rooms with plenty of natural light for organizing your events, seminars and receptions. Enjoy your business or leisure break and explore Poitou-Charentes, especially the Futuroscope Adventure Park, just a few metres from the hotel. Visit too, the historic centre of Poitiers and enjoy some of its specialist cuisine. Our Standard Rooms have been renovated with you in mind, to offer a more modern decor and ambiance. To the backdrop of a modern Bistrot-style setting, the restaurant serves a delicious range of dishes prepared from fresh, local produce. GOOD enviorment in the room. Good service of receiption ! the people are very kind and nice to me , even I can not speak French .and also good enviorment of the room. Could be perfect If there will be swimming pool in the future. I have been the third time in two months at this hotel,, réception very friendly room and bed perfect badroom clean and modern, check out fast and easy, having work in the Poitiers region I will return there.. Very welcoming staff. Particularly at breakfast, nothing was too much trouble to please us. Monsieur B., Nous vous remercions pour vos commentaires suite à votre séjour à Hôtel Mercure Poitiers Site du Futuroscope. C’est avec grand plaisir que nous recevons vos compliments. Aussi, nous ne manquerons pas de partager vos appréciations avec toute notre équipe. Votre satisfaction est la plus belle récompense pour notre personnel qui travaille jour après jour pour vous offrir un service irréprochable. Dans l’attente de vous accueillir de nouveau, nous vous prions de croire, Monsieur, en l’expression de nos sentiments les meilleurs. Good afternoon, We thank you for your feedback in regards to your stay in our hotel. Most of our staff speak a foreign language, some speak english and others spanish. However, even when we do not speak the same language as the client, we alway try to communicate (for example by gesture) to find out the customers needs, wich I'm sure we did with you. Best regards. Manuel. Very nice room, very clean. Little disappointed the hotel restaurant was closed. At our arrival late in the evening, it was not clear how to get to the lobby from the rear parking place. We had connecting rooms for us and our three children. Rooms were spatious and very clean. Water was provided as welcoming gift. Breakfast was rather basic. This is a 5 star hotel service in a motel quality facilities. How service can make a difference and even without special needs. Especially the reception and breakfast employees. conveniently sited hotel for the motorway with plenty of car park space. The room was clean and had everything we required for our stay. The evening meal was enjoyed and was fairly priced. All staff were helpful. Dear Mister c., We very much appreciate your comments regarding your stay at the Hôtel Mercure Poitiers Site du Futuroscope. It is always a pleasure to receive positive feedback. We are glad to see that you liked the room and that you also enjoyed your evening meal in our restaurant &quot;La Cuisine de Marie&quot;, a home made food with fresh products. Thank you again for sharing your experience, and we hope your next visit will be as pleasant as the previous one. Sincerely, Manuel. Despite nice personnel, the room layout and quality is very poor 2 plastic glass for a family of 5, Cheap looking room, low quality towels, etc... The only high thing was the price with a rate paid online at 261 euros while a big advertisement was showing the price of the day at 160 Euros !! A real Joke, despite again nice personnel. Nice room, good sleep, good dinner and excellent breakfast. We will stay there again. Pretty confortable, nice room with nice size, very confortable for family with kids. Only negative point is room lock did not work well and did not look like very safe. Good breakfast in a nice breakfast room.